If you look up Catamaran Charters BVI on the search engine of your browser, you’ll probably get lost on the results as there are surely many travel deals available. However, it’s best to find one that can get you to your dream vacation safely – when you want it and how you want it. That’s what we specialize in here at Nicholson Charters BVI. Your vacation is the best part of the year. No matter what month or season it is, your vacation needs to be special because you deserve it. After all the hard work you’ve done, a breath-taking reward like a catamaran charter vacation in the British Virgin Islands could be just what you need to thoroughly unwind and revitalize your spirit. Relaxing and letting yourself be one with nature helps you regain focus and allow yourself to divert your attention away from all the stress in life. Since the middle of the 80’s, catamarans began attracting sailing fanatics and began exploring the options of bigger, faster and more luxurious cruising amenities. Since then, catamaran charters in the BVI became more and more popular; with a wider range of cruising options to choose from. From huge, deeper draft monohulls, people began exploring the idea of smaller, yet luxurious yachts that can enter more anchorages which the larger counterparts could not enter. With the help of Nicholson Yacht Charter and Services, you can book your travel online and compare all of our available charters whether crewed or bareboat. Our wide variety of catamarans awaits you and you will find that our charter packages are truly flexible – in order to accommodate our clients’ desires in their travel itinerary. Once you’re sailing and cruising, there’s no such thing as a “strict schedule to follow”. This is because we want the trip of our clients be as spontaneous as they desire it to be; to allow themselves to follow what they want to do and where they want to go. You can definitely make your travel itinerary as how you want it. Since the BVI is a place of breath-taking beauty and serenity, all you need is a vessel to take you there. Stay at an island of your choice or embark on an island-hopping adventure. Go for a walk in some of the best shores found only at the British Virgin Islands or play water sports with your friends and family. Apart from the fact that catamaran chartering is a fun and exhilarating experience, it also gives you a liberating experience that you are unable to find anywhere else. 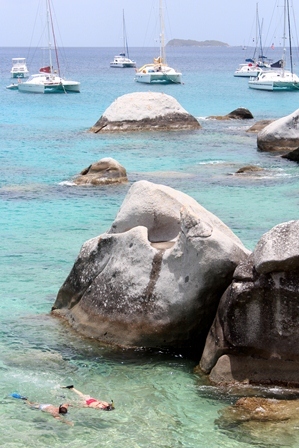 Be the closest you can get to marine wildlife in the British Virgin Islands. You won’t be left with nothing to do while you cruise in the Caribbean – sun, sea, islands and shores are just around the corner. Relax, enjoy and make sure that your next charter vacation will be booked through Nicholson Yacht Charter and Services.